Gov. Rosselló, far right, tours Boston Scientific's Dorado facilities along with other government and company officials. Gov. 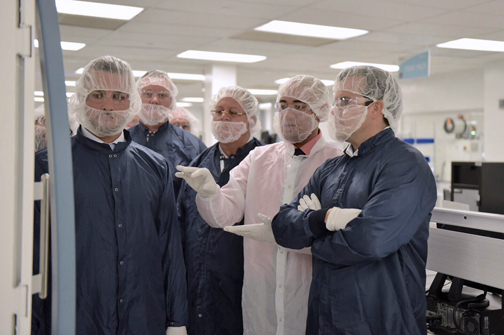 Rosselló, far right, tours Boston Scientific’s Dorado facilities along with other government and company officials. High-tech medical devices manufacturer Boston Scientific is investing $10.5 million and creating 100 new jobs at its Dorado plant, company and government officials confirmed Wednesday. Furthermore, the company inaugurated its Innovation Center, a specialized training space that will provide instruction focused on medical device technologies and minimally invasive therapies. Gov. Ricardo Rosselló made the announcement accompanied by the vice president of operations for Boston Scientific, Paul Martin, and Secretary of Economic Development and Commerce Manuel Laboy-Rivera. As part of the company’s operational expansion, Martin said Boston Scientific will open a unit to develop neuromodulation products — a technique that helps patients with chronic pain and movement disorders, including Parkinson’s disease. “The Innovation Center reinforces our commitment to promote science and education. These world-class training facilities are designed to meet the needs of cardiologists, electrophysiologists, neurologists and specialists in pain management, among other medical specialties,” Martin added. The Center also seeks to provide a place for exchanging ideas on advancing clinical practice. “We hope that the Center will become an integral part of the ongoing training of health professionals in Puerto Rico and the world,” the executive added. Boston Scientific’s neuromodulation product portfolio includes systems for spinal cord stimulation (SCS), radiofrequency ablation, and deep brain stimulation (DBS) systems. The Dorado plant will manufacture three models of leads used in the SCS and DBS systems. The 182,000 square-foot plant that employs more than 700 people also develops medical technology for the treatment of heart rhythm disorders. The company’s sales force in Puerto Rico has access to Boston Scientific’s worldwide products portfolio approved for sale in the United States. These include medical technology for the treatment of coronary diseases, digestive and respiratory conditions, urinary tract disorders and gynecological conditions, among others. Hey Buddy!, I found this information for you: "Boston Scientific pumps .5M into Dorado plant". Here is the website link: https://newsismybusiness.com/boston-scientific-dorado/. Thank you.